My younger brother–youngest brother for another month or so then–Joe scribbled all over the splash page of my subscription copy of JUSTICE LEAGUE OF AMERICA #131 with a black marker. Maybe he was trying to improve the inking, I don’t know. But it was one of those momentary childhood crises that come up from time to time, to say nothing of a persistent comic book collector’s nightmare. 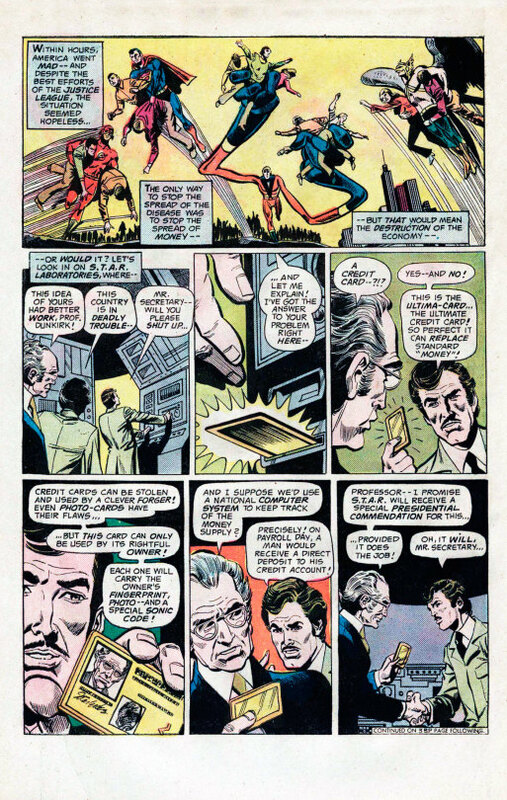 There was nothing to indicate it in this issue, but this story represented the beginning of an odd experiment by writer Gerry Conway and editor Julie Schwartz. 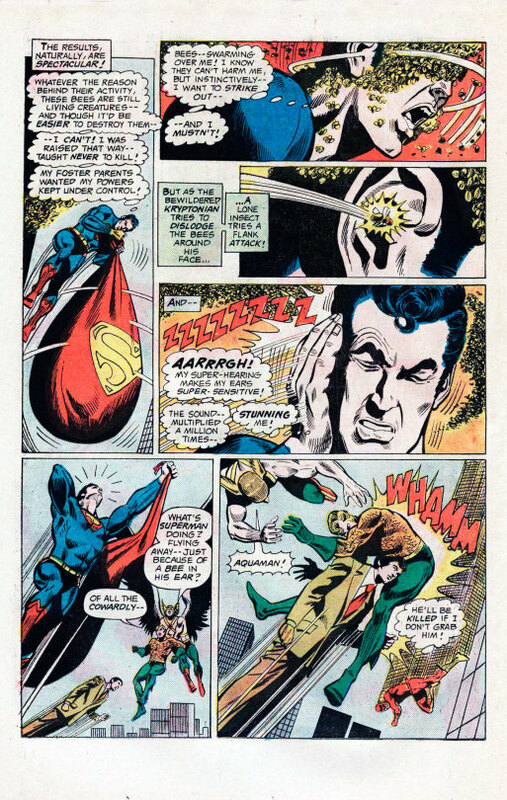 For the next four issues, the pair would present a series of two-part stories–except that the second part in each case would have virtually nothing to do with the opening half. I don’t know who thought this would be a good idea, but it frustrated me as a reader all the way through this process–especially as there was no particular resolution to the cliffhanger this issue ends on. Wasting no time, the story opens in the middle of the action, as Superman and the Flash corral a bunch of Central City citizens who are suffering from a new form of plague, one which causes people to become wild and psychotic, and gifts them with extraordinary strength. This plague, unfortunately, is being transmitted through currency, which explains why the economy has suddenly shifted over to using Ultima-Cards, hyper-sophisticated credit cards developed at STAR Labs by Professor Dunkirk. Children even use them to buy comic books! 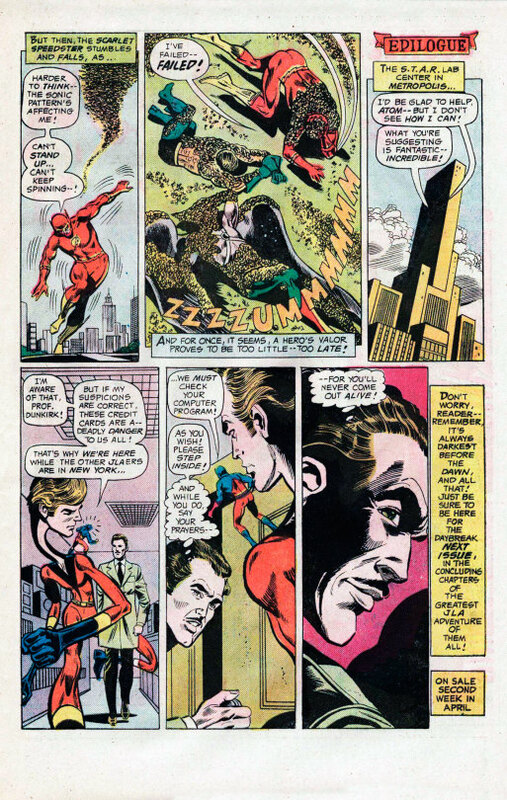 But weeks after that problem is sorted out, seemingly, the Atom and the Elongated Man find themselves facing a crisis in which zoo animals have escaped their cages, as though they were seemingly smart enough to open the locks. 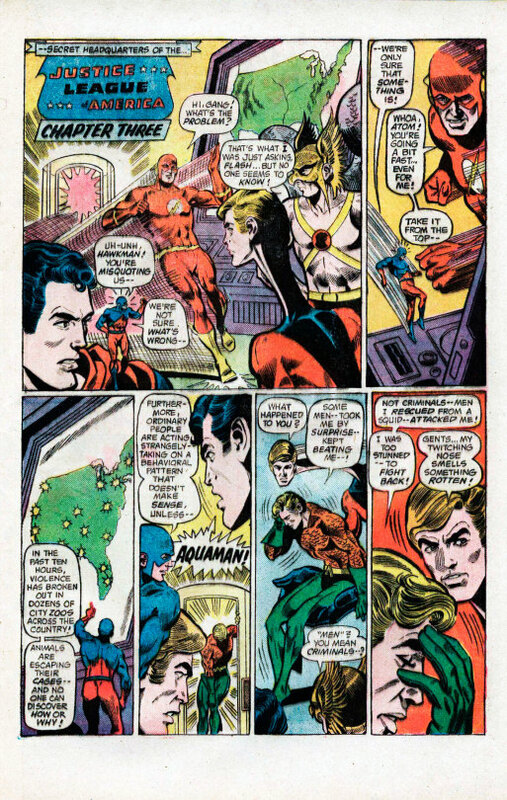 Meanwhile, the visitors to the zoo are all too dumbfounded to react, so it’s up to E-Man and the Atom to save the day. Sensing a larger problem in the offing, they send the JLA emergency signal. At that moment, deep under the sea, Aquaman is attempting to rescue a stricken submarine when he suddenly finds himself under attack by the very Octopus he had been telepathically communicating with for aid. 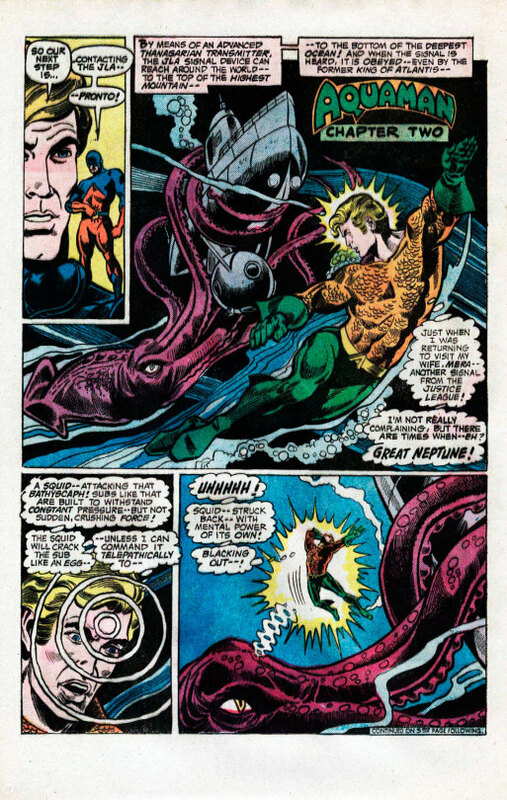 The Octopus shows surprising intelligence in attempting to smash Aquaman, but he’s able to complete his mission regardless–only to suddenly be jumped by the very submariners he was rescuing, who have been reduced to the mental level of beasts. There’s another plague going on! 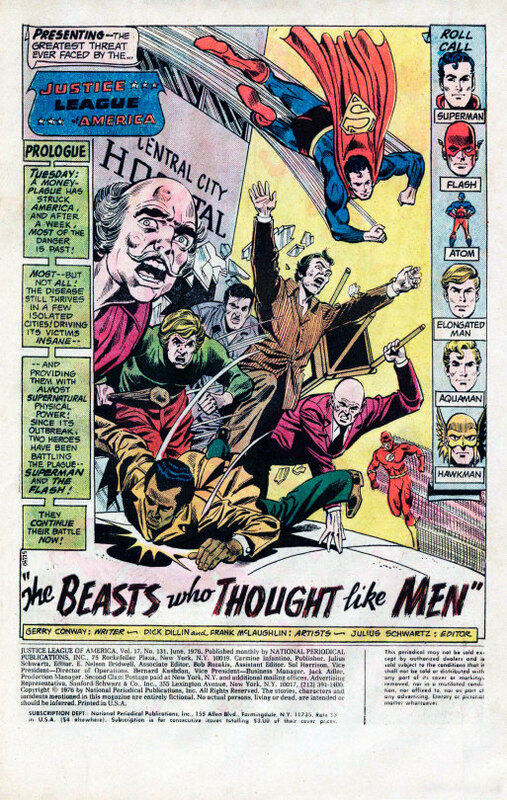 Rendezvousing at the JLA Satellite, the League is informed by the Pentagon of the nature of what is transpiring: men are acting like beasts and beasts like men. But they’re really calling because an enormous swarm of bees is headed towards New York. Superman, Flash, Hawkman and Aquaman move to intercept the swarm, and find their old foe Zazzala, the Queen Bee, at the heart of it. But Zazzala’s as much a victim as anybody. She claims that the sonic sub-signal which makes the Ultima-Cards impossible to counterfeit is also creating a “brainpower funnel”, transferring humanity’s intellect to the animals. Queen Bee herself had been enthralled by her own insect subjects, rather than the reverse. 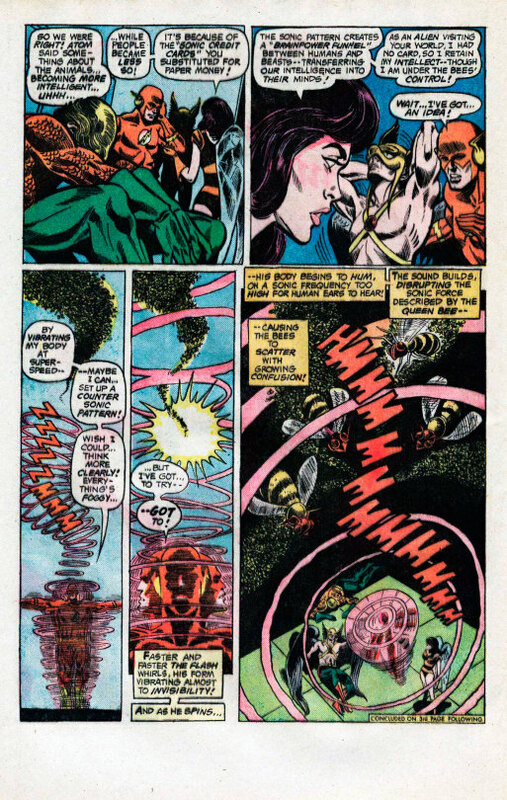 Flash tries to set up a counter-frequency to end the bees’ attack, but he fails, and the team is defeated. Meanwhile, at STAR Labs, the Elongated Man and the Atom are following up with Professor Dunkirk, clueing him in on the havoc his design is causing. But secretly, Dunkirk knows exactly what’s been happening–he is responsible, for mysterious reasons, and he ushers the Atom and E-Man into his lab intending to destroy their unsuspecting selves! And so ends the first half of this very odd two-parter!